Growing fruit trees at home is both gratifying and economical. The prices at supermarkets, farmer’s markets and high-end produce retailers border on the prohibitive. Furthermore, raising plants with edible harvest is nourishing to body, mind and spirit. Of course, not all climes are hospitable to fruit trees, especially those more arid and drought-prone. Take heart: there are several varieties of fruit that stand up well against such parched regions of the world. Hale and hardy, they flourish where other species whither. The key element is in the special care they need. Once educated, anyone can grow drought tolerant fruit trees. Also called a Chinese date or red date, the jujube are drought tolerant fruit trees native to mainland China. Over the millennia (four to be exact), growers tweaked this fruit from an originally sour flavor to a sweeter essence. First planted in North America in 1837, this tree grows up to 30 feet and consists of tough, stable wood. Its shiny, oval leaves generally adhere to one side of a given branch and they occupy a maximum of three square inches. Bearing three types of buds and four kinds of shoots, the Jujube tree produces its fruit on branchlets which grow, in turn, from a mother bearing shoot. Although the flowers are understated—pale and green—the fruit often sports a rich burgundy skin, white flesh and a single pit. More health-conscious consumers are turning to the pomegranate for its powerful antioxidant properties. Geographically, these drought tolerant fruit trees hale from a region between Tibet and the Mediterranean Sea (to narrow it down!). Most likely, early Spanish settlers first planted them on the North American continent. Its height ranges between 12 to 20 feet and the tree arrays itself with glistening, dark green leaves that are slow to fall in the autumn. Pomegranate berries have deep-red skin and contains hundreds of seeds (of varying hues) encased in juicy, edible flesh. This fruit grows on short spurs fro stems that are at least two-years old. Many cultivars are famously cold-hardy and growers can cultivate pomegranate trees so that they do not yield fruit. Kei apple trees grow to 30 feet tall, with canopies extending to 25 feet from one end to the other. It originates from southwest Africa but only thrives in the drier air of high altitudes. In addition to drought-resistance, ability to grow in soils of high salinity is another hallmark of Kei apple trees. The fruit is ready to pick by mid-autumn but harvesting the apples is complicated by the trees thorny branches. 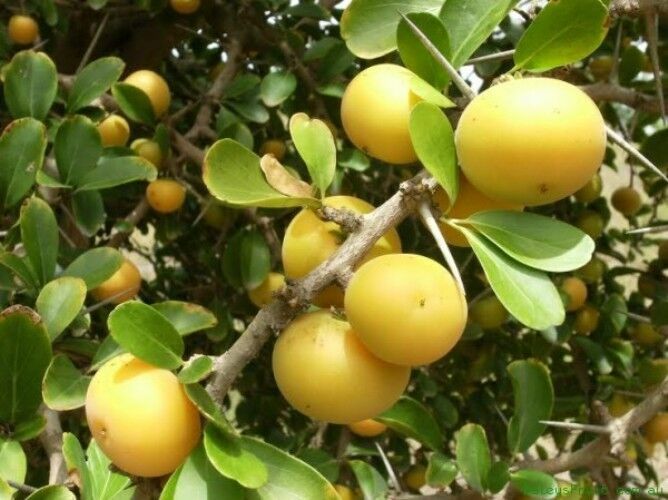 Once off the drought tolerant fruit trees, at any rate, the flattish, bright yellow fruit is popular in fruit salads, jams and preserves. Displaying very dark, green leaves and spiny branches, the natal plum (or Carissa) shrub also sports white, five-pointed flowers that create a pleasing aesthetic quality. It can reach up to 10 feet in height while its canopy can spread by the same measure in width. The flowers, moreover, give off a distinct and pleasing aroma. The drought tolerant fruit trees possess a high vigor for myriad soil conditions. 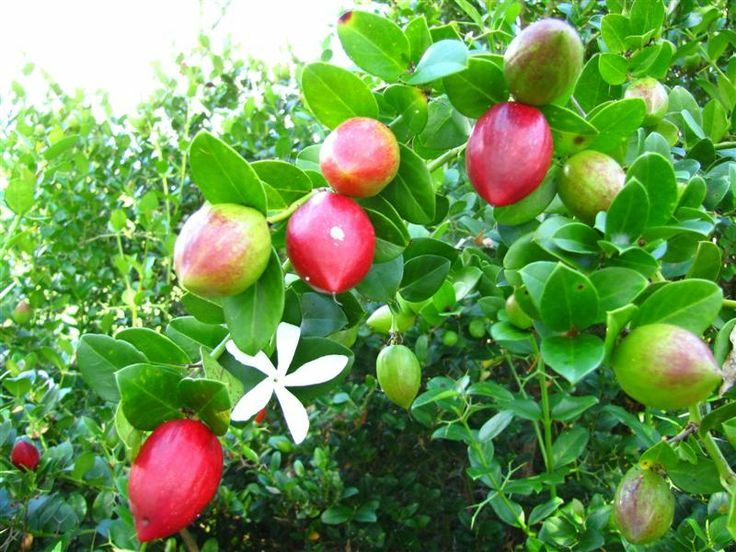 Natal plum fruit reaches three inches in diameter with bright red skin; the flesh is of the same color. Rich in vitamins A and B, this plum exceeds even citrus fruits in vitamin C content. In warm climates—even dry ones—they can grow throughout the winter. Better still, pests have little interest in them. Natal plums are edible fresh, in chutney or even pickled. Persimmon trees exist in two classes: native and Oriental. Since the Oriental variety gets higher marks for fruit production and overall sturdiness, we focus on it exclusively. 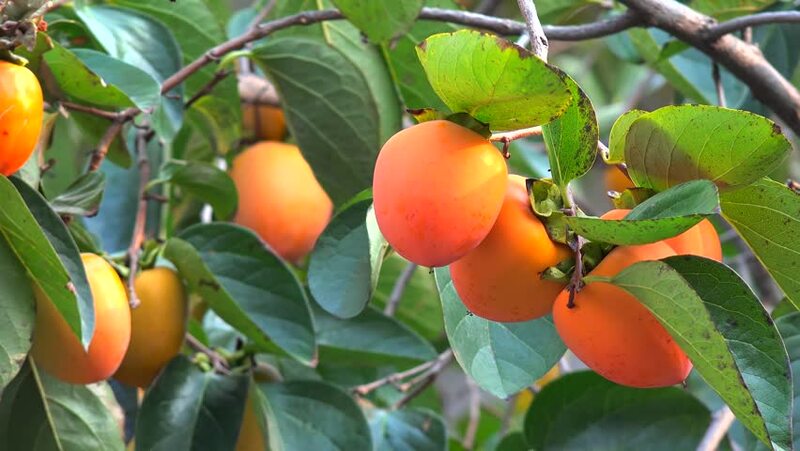 Largely free of insects and diseases, the Oriental persimmon tree almost never tops 30 feet. Young, growing trees need pruning for branches to yield optimal fruit whereas mature trees do not. As a matter of fact, early pruning keeps the tree from bearing too much fruit—a strain on its brittle wood. Sometimes mistaken for tomatoes, persimmons have an orange to reddish brown skin and orange flesh on the inside. Oriental persimmons can grow to the size of a large peach. They are frequently eaten fresh, in baked goods or in puddings. People can sometimes confuse pineapple guava (i.e. feijoa) with avocado because of its rich green shade and pear shape. 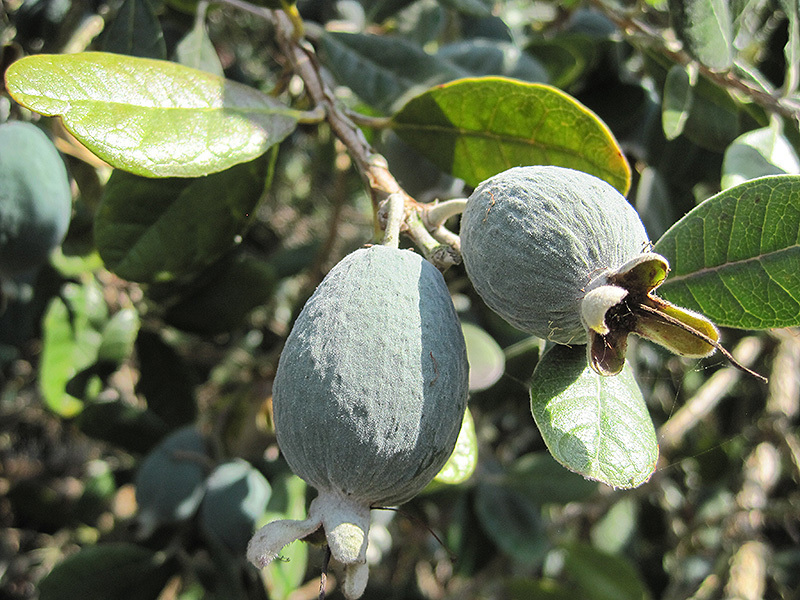 Coming from the mountainous regions of central South America, feijoa trees grow to only fifteen feet in both directions. Its multicolored flowers are also edible. The drought tolerant fruit trees do well in both sun and shade, providing cover for fauna and nutrition for hummingbirds. Pineapple guava does retain the flavor of pineapple and guava, also giving off a hint of strawberry. Its milky white flesh contains generous amounts of potassium, vitamin C and fiber. Since the skin is hard to digest, the meat of the fruit is ordinarily scooped out. Figs have a romantic, Near Eastern appeal, noted in the Bible and Arabic folklore. That said, gardeners raise fig trees in many parts of the world. An interesting property of the common fig tree is that its width can exceed its height, which reaches up to 30 feet. The drought tolerant fruit trees need ample sun but are not finicky about the soil in which they grow. 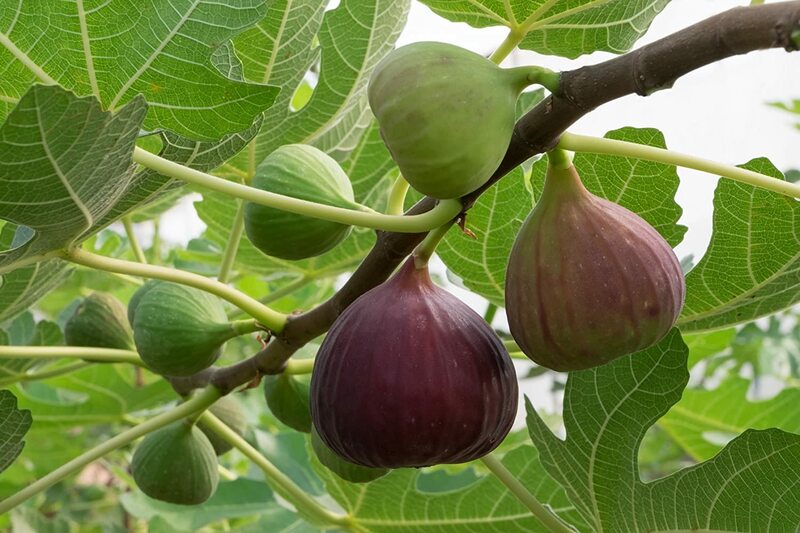 Although they bear up in dry climates, watering every three to five days in summer makes larger figs more likely. They may take three years to produce viable fruit. Fortunately, the threat from pests is minimal. Ripened figs have a brown and purplish color and are soft to the touch. Worth noting is the fact that all of these trees serve well as ornamentals and need not be cultivated for edible fruit. Whether for food or appearance or both. The durability of these species in cold and dry climates makes them valuable additions to any landscape. Hey Buddy!, I found this information for you: "7 Drought Tolerant Fruit Trees to Plant in Dry Climates". Here is the website link: https://backtofarm.com/drought-tolerant-fruit-trees/. Thank you.